At least 31 people have been killed as massive wildfires raging in Northern and Southern California have engulfed thousands of homes and were threatening to destroy more as blustery winds were dealing firefighters a menacing challenge throughout the state over the weekend and into today. "This week, California has experienced the most destructive fires we have seen in its history. There are 196,000 acres burned, thousands of homes and dozens of lives lost," Chief Scott Jalbert of the California Department of Forestry and Fire Protection said Sunday morning. The largest and deadliest of the infernos is the Camp Fire, which as of Sunday had burned 109,000 acres, leveled 6,435 homes and another 260 commercial structures in Northern California's Butte County, according to officials. There were at least 228 people unaccounted for as of early Monday. At least 29 civilians have been killed in the Camp Fire, which ignited on Thursday and quickly swept through communities in the Sierra foothills, nearly wiping out the bucolic town of Paradise. At least five firefighters have been injured battling the blaze. 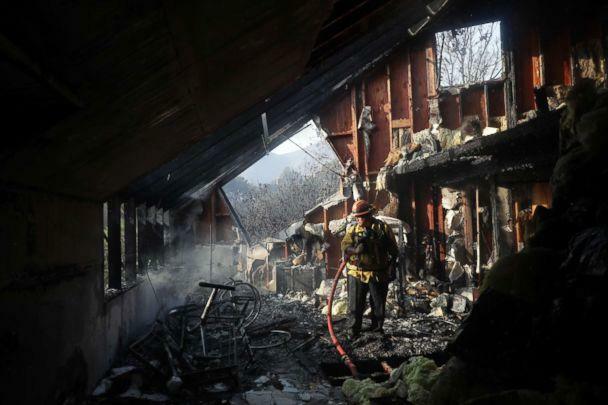 On Sunday, the monstrous fire was 25 percent contained, according to Cal Fire. Two other people were killed in the Woolsey Fire burning in Southern California, bringing the death toll from the California wildfires to 25 on Sunday. The threat from the Camp Fire isn't expected to diminish anytime soon, as gusty weather ramped back up Sunday. Red flag warnings signaling extreme fire danger have been issued for parts of Northern California, including the areas surrounding Sacramento and San Jose. 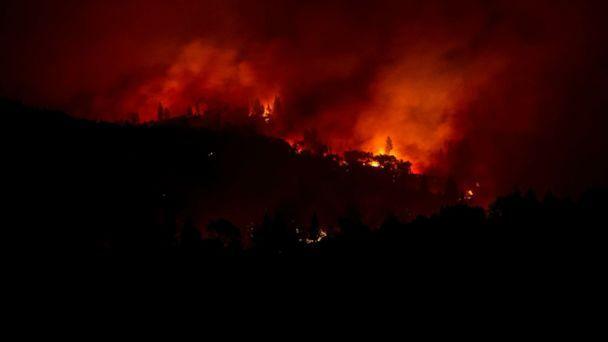 More than 149,000 people throughout the Golden State have evacuated as a result of the fires, outgoing California Gov. Jerry Brown told reporters Sunday afternoon. California Gov. Jerry Brown on devastating wildfires raging across the state: "This is not the new normal, this is the new abnormal." Wind gusts could reach 50 mph across the eastern foothills and western slopes of the northern Sierra Nevada mountain range through today, as well as parts of the Sacramento Valley. On Saturday, Shawn Field of Paradise didn't know if his house was still standing. On Sunday morning, an ABC News crew found Field's home completely destroyed. The only thing left intact was a green coffee cup. "This is real," Field said. Field said he and his family moved into the house on Honey Run Road in March. He said his son was home when the fire moved close to their house on Thursday and that he had about 10 minutes to pack up some belongings and get out. "He was able to pack a backpack and a small duffle bag of things we could use, and that's all we have," said Field, who is staying with friends about 15 miles away in Chico. Despite his loss, Field said his spirits have been boosted by the support he and his family have gotten from friends and strangers. "It's awesome how many people are rallying around and helping us out," he told ABC News. Meanwhile, the Woolsey Fire in Southern California was only 15 percent contained Sunday after blackening 85,500 acres across Los Angeles and Ventura counties and destroying 177 structures, Cal Fire said. Another fire burning in the area, the Hill Fire, was 70 percent contained Sunday after it consumed 4,531 acres in Ventura County near Thousand Oaks, where a gunman killed 12 people Wednesday night at a country bar before taking his own life. 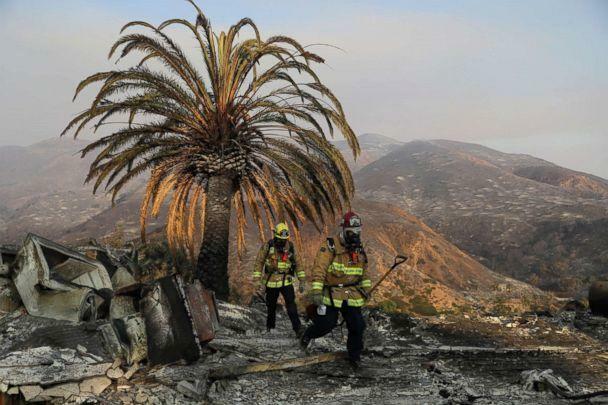 "This morning, the Santa Ana wind condition has reestablished itself and is going to be in the area for the next couple of days," said Tony Imbrenda, spokesman for the Los Angeles County Fire Department. Two people were found dead in Malibu from the Woolsey Fire, officials from Cal Fire said. Detectives believe that the victims, found in a vehicle off the Mulholland Highway, were killed after the driver became disoriented while evacuating and the car was overcome by fire, Los Angeles County Sheriff's Department Cmdr. Scott Gage said in a press conference Sunday afternoon. "Oh my God, I'm surrounded by fire." More than 3,200 firefighters battling the Woolsey Fire are bracing for more tough days to come on the fire lines due to strong Santa Ana winds of up to 40 mph that threaten to blow embers into areas that have not burned, officials said. "This is a wind-driven event and the winds are coming back," Chief John Benedict of the Los Angeles County Sheriff's Department said Sunday. "Everybody needs to remain vigilant and please stay out of the areas that we've determined to be evacuation zones." Benedict said the cities of Hidden Hills, Agoura Hills, Westlake Village, Calabasas and Malibu remained under evacuation orders. He also said the fire appeared to be moving west toward the Pacific Ocean and he advised residents in Topanga Canyon to evacuate. "We have reports of numerous residents in the Topanga area that have chosen to shelter in place and we're advising them to immediately leave and move to one of the shelters or to other locations out of danger," said Benedict, adding that he and his family have been evacuated twice since the fire broke out. Ventura County Fire Department Chief Mark Lorenzen implored people to leave evacuation zones. He said the fire was burning everything in its path including ice plant. "Ice plant is not supposed to burn," Lorenzen said Sunday. "So my message to the community today is maybe 10 to 20 years ago you stayed in your homes when there was a fire and you were able to protect them. Things are not the way they were 10 years ago. The rate of spread is exponentially more than what it used to be." On Friday and Saturday, 23 bodies were discovered in communities ravaged by the Camp Fire, most of them found in Paradise, the Sierra foothills town of 26,551 people that was almost completely destroyed in the blaze. An additional six bodies were later found, Butte County officials announced Sunday evening. 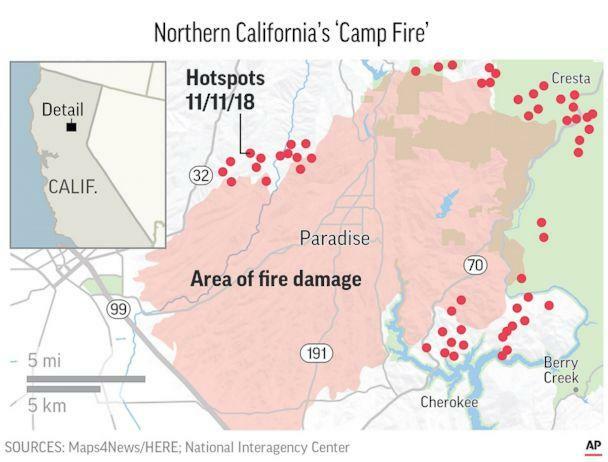 The Camp Fire is now one of the deadliest wildfires in California history, tied at No. 1 with the 1933 Griffith Park fire in Los Angeles, which also claimed 29 lives, according to Cal Fire. At nearly 7,000 structures burned, the Camp Fire is also the state's most destructive. Four of those victims were found dead in or near torched vehicles. Autopsies will be conducted to determine the circumstances of the deaths and to identify the individuals, but investigators believe their cars were "overcome" by the flames, according to a statement from the Butte County Sheriff's Office on Friday night. There were more than 100 people missing in the region, though officials were working to track them down. At least 70 people reported missing were located on Saturday and are now safe, officials said. The Butte County Sheriff's Office has activated a call center for the public to provide and receive information about those thought to be missing. Authorities have received reports of additional fatalities due to the blaze, which investigators are working to confirm. On Sunday, Brown requested President Trump issue a Major Disaster Declaration to bolster the ongoing emergency response and aid residents in their recovery from devastating fires throughout the state. "We have the best firefighters and first responders in the country working in some of the most difficult conditions imaginable," Brown said in a statement Sunday. "We're putting everything we've got into the fight against these fires and this request ensures communities on the front lines get additional federal aid. To those who have lost friends and family members, homes and businesses, know that the entire state is with you. As Californians, we are strong and resilient, and together we will recover." Late on Friday, President Donald Trump declared a state of emergency for California, freeing up federal resources to supplement local response efforts. The declaration allows the U.S. Department of Homeland Security and the Federal Emergency Management Agency to coordinate disaster relief efforts to help alleviate the hardship and suffering caused by the emergency on the local population, provide support for emergency measures and free up federal resources. But on Saturday morning, Trump threatened to pull federal funding for California wildfires if the state didn't "remedy" its poor "forest management." "Our focus is on the Californians impacted by these fires and the first responders and firefighters working around the clock to save lives and property — not on the president’s inane and uninformed tweets," Brown's press secretary, Evan Westrup, told ABC News on Sunday. Brian Rice, president of California Professional Firefighters, called Trump's threat to slash funds for battling California wildfires "ill-informed, ill-timed, demeaning to those who are suffering as well as the men and women on the front lines." Rice said Trumps assertion that California's forest management policies are to blame for the catastrophic wildfires is "dangerously wrong." "Wildfires are sparked and spread not only in forested areas but in populated areas and open fields fueled by parched vegetation, high winds, low humidity and geography," Rice said.